Pollock – fish of the cod family, is one of the most popular on the Russian tables, mainly because of its availability. This is a useful product, rich in many vitamins, phosphorus, potassium and proteins which are well absorbed by the body. From Pollock to prepare a large number of light and healthy dishes. One of the characteristics of Pollock is that this fish has no pronounced taste, which makes it a versatile ingredient in many dishes, and the opportunity to buy it at almost any store doing this sort of fish is very affordable. Pollock can give completely different flavors by cooking it with different sets of products. - fresh carrots, 2 PCs. To cook a dish, you need to clean the onions and carrots. Chop onion finely, diced, and carrots grate on a coarse grater or cut into strips. Then fry the vegetables in vegetable oil. The fish should be cleaned, cut into pieces. Pollock should be spread in any pan with thick walls, add cooked fried, add salt, add spices. 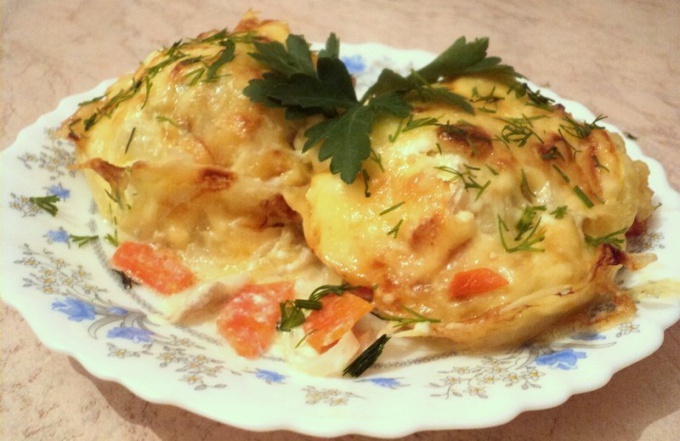 You then pour the fish with sour cream and bake for half an hour. The finished dish is well served with fresh herbs, e.g. dill, parsley or other herbs. As the meat of this fish by itself is pretty light and delicate, it is possible not only to stew, bake or fry and use the to prepare more original dishes such as the famous fish in batter. The cooking process is best to start with slicing the pieces of fish. After her need to leave somewhere for half an hour, add salt and spices to your taste to make it have a sweet smell of spices. It is worth noting that buy Pollock is best chilled, but not frozen, so that when defrosting the product has not deteriorated its taste. Tip: for this recipe it is better to use fillet to subsequently small bones could not damage the process of enjoying the dish. While the fish is soaked with spices, preparing the batter. For this milk you need to mix with salt, egg yolk and flour, stir all the ingredients. Protein can be beaten separately and then add to the mixture and stir again. In the prepared batter to dip the fish and fry in sufficient quantity of sunflower oil. Please note: the frying pan before roasting must be well heated. The finished dish is best served with fresh greens.